Our featured teacher for the month of April is Sara Carnohan. She is a 1st grade teacher at Conowingo Elementary School in Conowingo, Maryland. 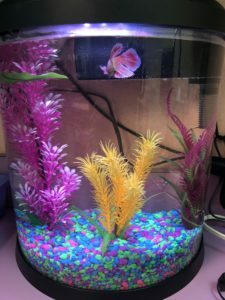 Her classroom pet, a betta fish named Bubbles, has built a sense of responsibility, reduced stress and anxiety, and increased learning for her students. Why did you decide to get a classroom pet? I felt that my students would benefit from having the responsibility of taking care of the pet and they would enjoy having it as a classroom job. Why did you decide to get the type of animal you have? I wanted a pet that could stay in the classroom over the weekend and short breaks. How do you use your classroom pet to facilitate learning? 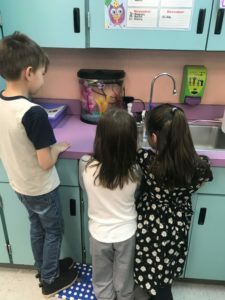 We have had discussions about the type of fish that we have, what it needs to survive (heated water, plants, filter), how to take care of it and how to feed it. Students take part in naming our fish as well. What is your favorite thing about having a classroom pet? Students taking responsibility and caring for the pet. Did you see an improvement in your classroom due to the classroom pet (specific stories are appreciated)? Yes, I have had students that are more reserved or that get anxious at times, that enjoy watching the fish in order to calm down. Some students enjoy watching the fish as their brain break instead of participating in dancing/physical breaks. What advice do you have for teachers who are thinking of getting a classroom pet? It is a great way to build a sense of responsibility with students. It can reduce stress and anxiety and increase learning for students.